Documentation: Specimen: HMM 2710, 5 Oct 1916 Inland, Clay Co.
Taxonomy: Of seven recognized subspecies, all but one occur in Eurasia; the lone North American subspecies is richardsoni (Gill and Donsker 2017). 5 Oct 1916 Inland, Clay Co (cited above). Of four reports, only one is documented: a specimen on display at the Hastings Municipal Museum was collected by Clyde Ley near Inland 5 Oct 1916 and described by Swenk (Bray et al 1986). The other reports are as follows. One was seen in a barn in Webster Co 16-17 Dec 1963 (Turner 1964); it was described as being the size of a screech owl, but without ear tufts, with a pale bill. One captured live in Lincoln, Lancaster Co 10 Dec 1892 (Bruner et al 1904) was said to be in the UNSM collection, but it cannot now be located (Bray et al 1986). Another was said to have been perched on a “shock of grass” near Salt Creek in Lancaster Co 19 Oct 1907 (Swenk 1907). Comments: The Boreal Owl breeds close to western Nebraska in southeast Wyoming and north-central Colorado; it is considered nomadic (Hayward and Hayward 1993), and so it seems possible that birds may reach Nebraska from Colorado or Wyoming in severe winters. However, all records from neighboring states are from eastern South Dakota and Iowa, likely originating from Minnesota. There are four from South Dakota, all near the eastern border, Aug-Jan (Tallman 2002), and about 10 for Iowa, all but two (Nov and “spring”) prior to 1915 (http://iowabirdrecords.org/Reports). In Minnesota, this species stages occasional invasions, during which birds appear mid-Jan through Mar, and are usually emaciated (Janssen 1987). Since 1976, a consistent fall migration has been detected in Minnesota, beginning in Oct (Janssen 1987). 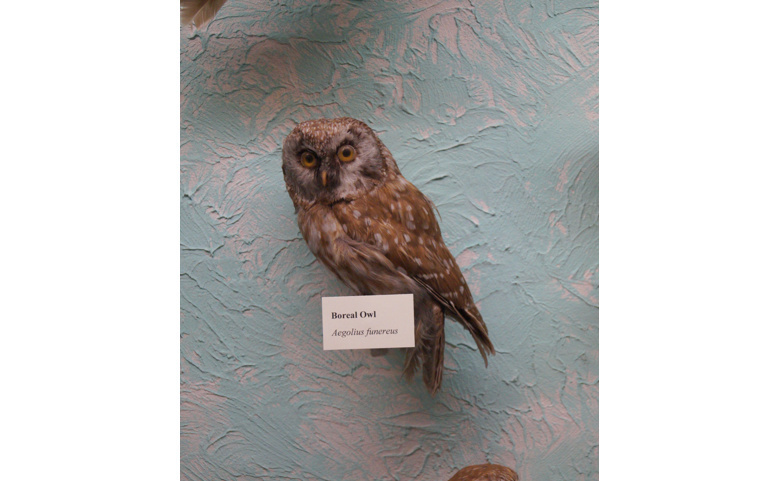 Photograph (top) of Boreal Owl mount by Joel G. Jorgensen. The specimen is housed and maintained at the Hastings Municipal Museum and may be the specimen purportedly collected at Inland, Clay Co 5 Oct 1916. We thank Teresa Kreutzer-Hodson for facilitating the photographing of this specimen for the Birds of Nebraska – Online. Swenk, M.H. 1907. Two interesting Nebraska records. Auk 24: 223. Turner, H. 1964. Boreal Owl in Webster County. NBR 32: 12-14.